Serbia and Bosnia call for international help to rescue people from flooded areas after the worst flooding since modern records began. Waters are now beginning to recede, but officials say dangers remain. They say that the threat of landslides is an ever-present problem as are the difficulties caused by unexploded landmines in Bosnia and river surges. Serbia’s main power plant is still at risk of flooding. Tens of thousands of people have fled their homes. 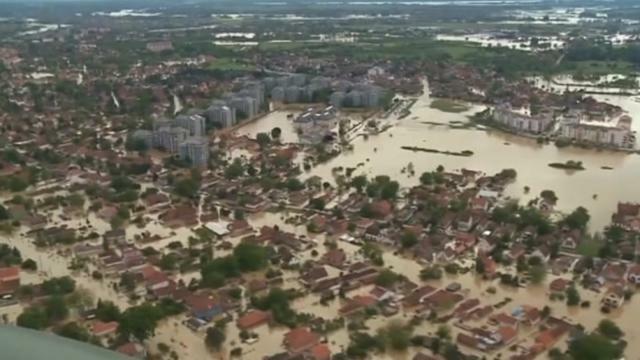 Bosnian Refugee Minister Adil Osmanovic described the flooding as “catastrophic”. Officials say that three months’ worth of rain has fallen on the Balkans in recent days, producing the worst floods since rainfall measurements began 120 years ago. At least 35 people have died – with more casualties expected. A large international aid operation is underway, with rescue helicopters from the European Union, US and Russia evacuating people from affected areas. Serbian PM Aleksandar Vucic said Serbia now needed further help, particularly deliveries of food, clothing and bottled water. The rain caused more than 2,000 landslides in hilly Bosnia, officials say, enveloping roads, homes and whole villages. Rescuers are urging people to go to the balconies or rooftops of their houses with bright fabric to make themselves visible. The north-eastern part of Bosnia is reported to be especially badly affected, with houses, roads and rail lines submerged. Officials say that about a million people – more than a quarter of the country’s population – live in the worst-affected areas. The floods and landslides have raised fears about the estimated one million land mines planted during Bosnia’s 1992-95 war. Nearly 120,000 of the unexploded devices remain in more than 9,400 carefully marked minefields, officials say. But the weather dislodged warning signs and in many cases loosened the mines themselves. The flooding and landslide threat in Serbia is equally serious, made worse by the constant threat of surging river levels. Residents spent the weekend piling up sandbags in riverside towns – including Belgrade. Serbia’s state-run EPS power company said crews were doing all they could to prevent further damage to the Tesla power plant. Parts of the plant and a nearby mine that provides its fuel were underwater. Damage to the mine alone is estimated at more than $137 million. “Support and solidarity for my people in Serbia!” he wrote on Twitter. Large parts of eastern Croatia are also underwater, with villages still cut off and hundreds forced to escape the flooded zone in boats and trucks.